Save the Date! Free Workshop! 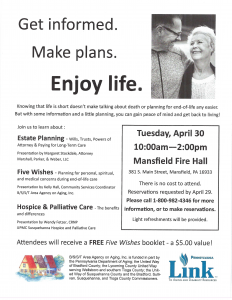 Area Agency on Aging and PA Link are teaming up to present a free workshop on Estate Planning, Five Wishes and Hospice & Palliative Care. The presentation will be on Tuesday, April 30, 2019 from 10:00am -2:00pm at the Mansfield Fire Hall. Please see the flyer for more information. Copyright © Tioga Bradford Housing & Redevelopment Authority. All Rights Reserved.